Draft-zhang-pim-multi-upstream-igmp-mld-proxy-01 Shuai Gao Beijing Jiaotong University HAW Hamburg 2013.8 Multi-Upstream Interfaces IGMP/MLD Proxy. 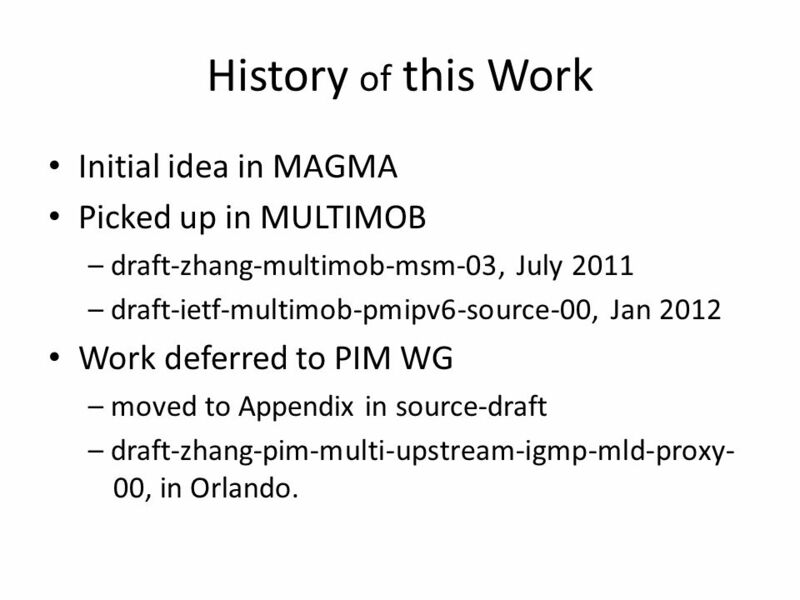 2 History of this Work Initial idea in MAGMA Picked up in MULTIMOB – draft-zhang-multimob-msm-03, July 2011 – draft-ietf-multimob-pmipv6-source-00, Jan 2012 Work deferred to PIM WG – moved to Appendix in source-draft – draft-zhang-pim-multi-upstream-igmp-mld-proxy- 00, in Orlando. 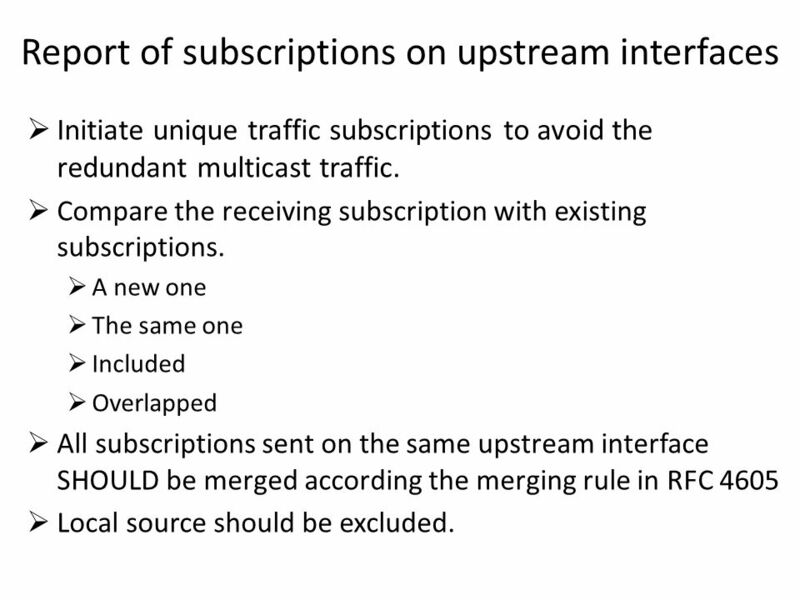 5 Report of subscriptions on upstream interfaces  Initiate unique traffic subscriptions to avoid the redundant multicast traffic.  Compare the receiving subscription with existing subscriptions.  A new one  The same one  Included  Overlapped  All subscriptions sent on the same upstream interface SHOULD be merged according the merging rule in RFC 4605  Local source should be excluded. 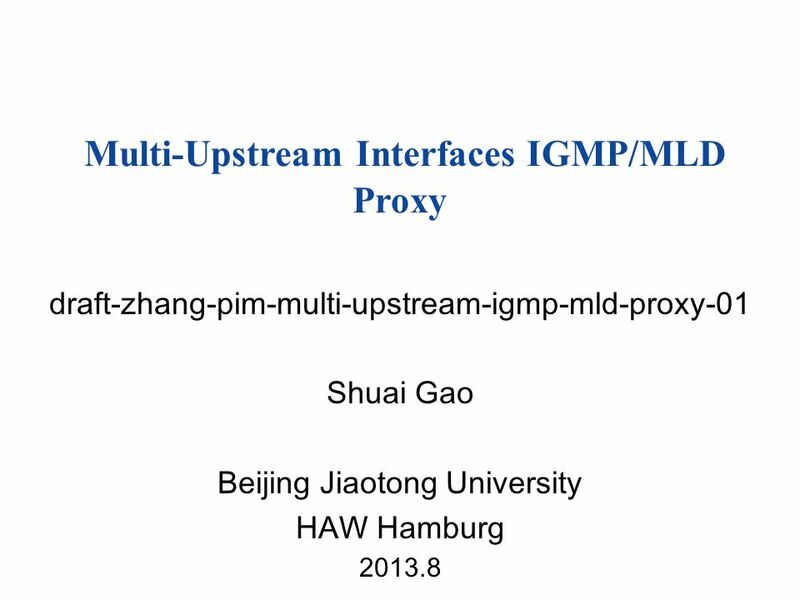 Download ppt "Draft-zhang-pim-multi-upstream-igmp-mld-proxy-01 Shuai Gao Beijing Jiaotong University HAW Hamburg 2013.8 Multi-Upstream Interfaces IGMP/MLD Proxy." NetExt WG IETF-75 Mobility Session Suspend Ahmad Muhanna, et al. Tuning the Behavior of IGMP and MLD for Mobile Hosts and Routers draftasaedamultimobigmpmldoptimization02 Hitoshi Asaeda (Keio University) Stig Venaas. Tuning the Behavior of IGMP and MLD for Mobile Hosts and Routers draftasaedamultimobigmpmldoptimization04a Hitoshi Asaeda, Yogo Uchida Keio University. L. Alchaal & al. Page Offering a Multicast Delivery Service in a Programmable Secure IP VPN Environment Lina ALCHAAL Netcelo S.A., Echirolles INRIA. PMIPv6 Extension for Multicast draft-asaeda-multimob-pmip6-extension-07 Hitoshi Asaeda Pierrick Seite Jinwei Xia 82 nd IETF, November 2011, Taipei, Taiwan. Netext issues Julien Laganier, IETF-80. 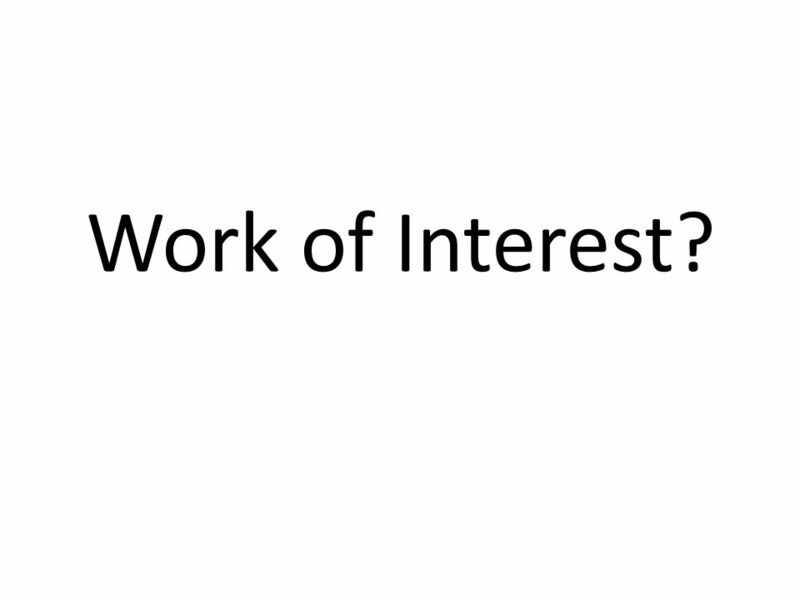 Logical Interface (I) #1: Replication of ND multicast messages across physical interfaces – What is in the source. 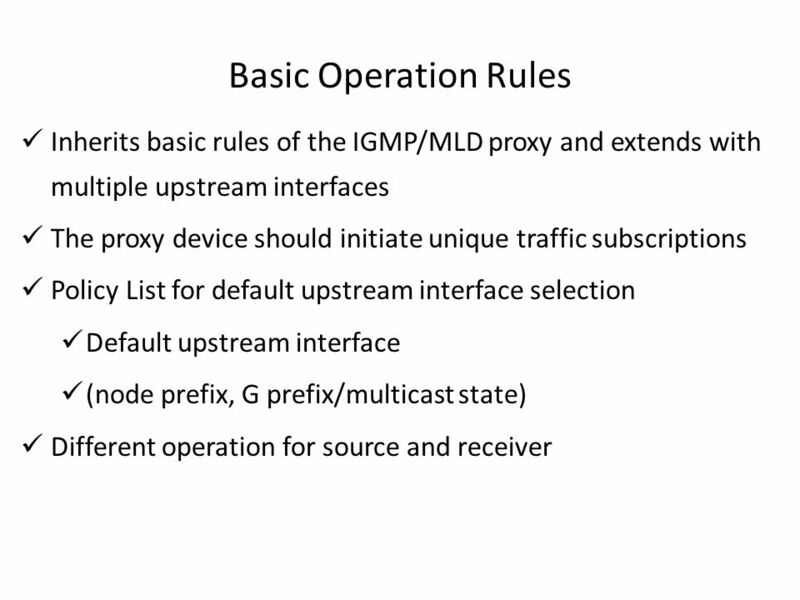 1 Proposal for Tuning IGMPv3/MLDv2 Protocol Behavior in Wireless and Mobile networks Qin Wu Hui Liu 79 th IETF Beijing draft-wu-multimob-igmp-mld-tuning-03. DAD Optimization Youn-Hee Han Samsung Advanced Institute of Technology 57 th IETF, Vienna, Austria July 13-18, 2003. PMIPv6 Extension for Multicast draft-asaeda-multimob-pmip6-extension-05 Hitoshi Asaeda Pierrick Seite Jinwei Xia 80 th IETF, March 2011, Prague, Czech. 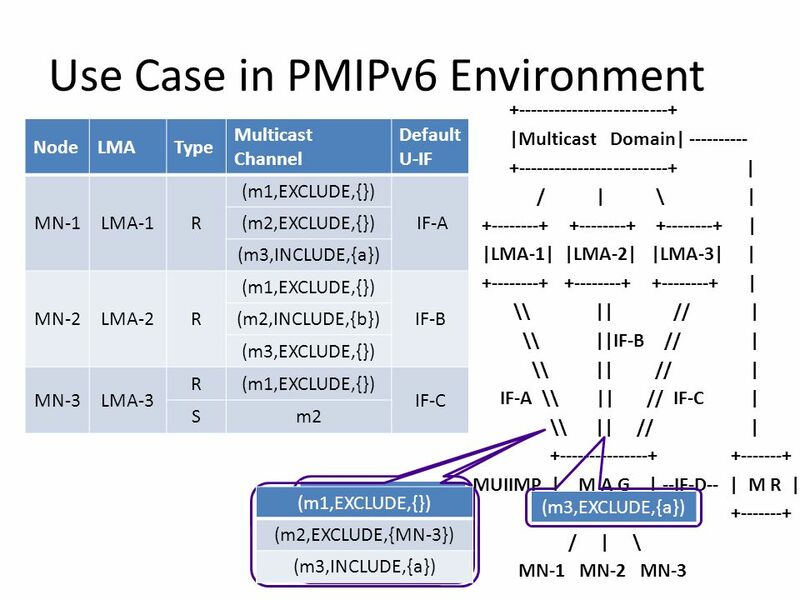 IPv4-Embedded IPv6 Multicast Address draft-ietf-mboned-64-multicast-address-format IETF 84 Vancouver 1. MultiMob WG. Potential future work (draft-von-hugo-multimob-future-work-02) IETF 78, Maastricht / Dirk von Hugo (Deutsche Telekom), Hitoshi. IGP Multicast Architecture Lucy Yong, Weiguo Hao, Donald Eastlake Andrew Qu, Jon Hudson, Uma Chunduri November 2014 Honolulu USA draft-yong-rtgwg-igp-mutlicast-arch-00. 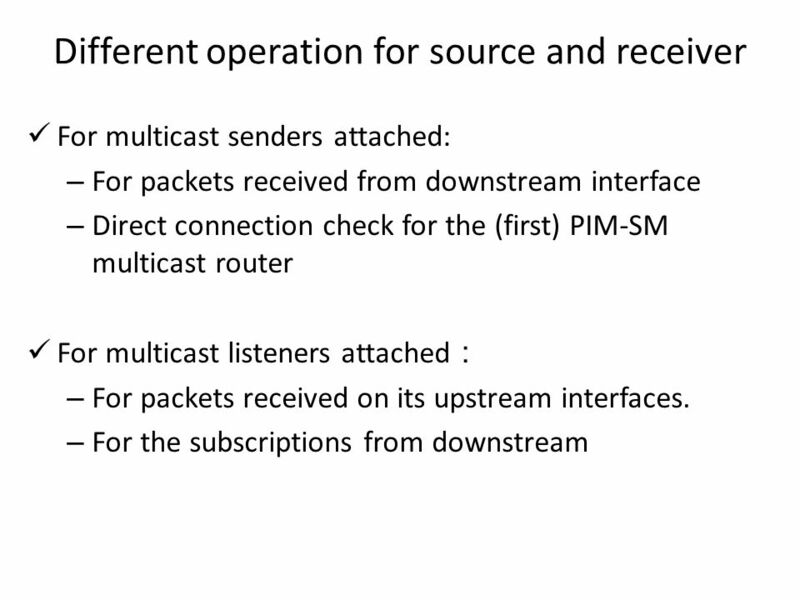 Multimob possible future work I’: dmm multicast D. von Hugo Contributions from S. Figueiredo, S. Jeon, D. Liu IETF-83, Paris 1. Concerns about designating the MAG as a Default Router James Kempf NETLMM Interim Sept. 27, 2006. DVMRP Distance Vector Multicast Routing Protocol Jerad Bates UMBC - Fall 2006.